Norethisterone is a synthetic version of progesterone, a hormone involved in regulating the menstrual cycle in women. It can also be used to treat certain medical conditions such as endometriosis, heavy periods or painful periods. 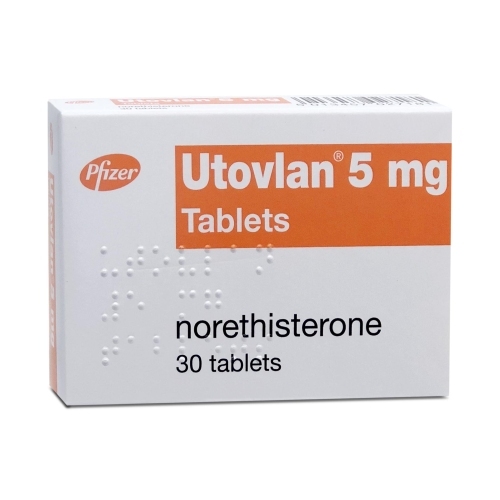 Utovlan is a branded version of norethisterone. How does norethisterone work to delay periods? Progesterone levels fluctuate throughout the course of the month. Towards the end of the cycle, progesterone levels drop, causing the lining of the womb to break down and it is expelled via bleeding, known as a period. Norethisterone works to keep levels of progesterone elevated, so that the lining of the womb is not broken down. This stops bleeding. How do I take period delay tablets? For norethisterone to be effective, you should take one tablet three time a day, starting three days before your period is due. Keep taking the tablet for as long as you want to be period free. Your period will recommence 2-3 days after stopping norethisterone. Do I need to eat before taking norethisterone? Norethisterone can be taken with or without food. Does it matter when I start taking norethisterone? You should aim to taking norethisterone three days before your period is due. The closer you take it to your expected period, the higher the chances of spotting. If you miss a dose of norethisterone, take it as soon as you remember. If you remember when it is time for your next dose, do not take two tablets together. How long can you take norethisterone tablets for? Norethisterone tablets can be taken for a maximum of 20 days, giving 17 days period free (as it needs to be taken three days before the onset of a period). Your period will start around 2-3 days after stopping norethisterone. How effective is norethisterone in delaying periods? Most women find that norethisterone is effective at delaying their period. Some women may find that they experience occasional spotting (small spots of blood that are visible on underwear), or light breakthrough bleeds. Taking norethisterone closer to the time of your expected period can increase the chances of this happening. It is important to try and take norethisterone three days before your expected period to reduce the chances of this spotting. What if I am taking the contraceptive pill? Norethisterone cannot be taken with the contraceptive pill in any circumstance. If you are taking the progestogen only pill, also known as the mini pill, there is no need to take a period delay tablet, as it is highly unlikely that you are having periods. If you are taking a combined contraceptive pill, you can avoid having a period by taking two packets back to back (missing out the tablet free days). You can take up to three packets back to back. This is common practice and works for 21-day monophasic pills such as Microgynon, Yasmin, Rigevidon and Cilest. If is important to seek advice from a healthcare professional before doing so. If you are taking a 21-day phasic pill such as Logynon or Binovium, you should consult your GP or pharmacist. This is because each pill contains a different amount of hormones and need to be taken in the correct order to be effective. Will norethisterone stop me from getting pregnant? Norethisterone can prevent pregnancy at a different dose. The dose required to delay periods is different to the dose required to prevent pregnancy, and will not protect you from getting pregnant. You may wish to consider a combined oral contraceptive pill and miss out the tablet-free interval if you wish to benefit from contraception. Are period delay tablets safe? Norethisterone tablets are an effective way in delaying periods. You should always check with your doctor beforehand to see if it is suitable for you to take these tablets, as it can be dangerous for some women (e.g. women with a personal or family history of blood clots). You should fill out our questionnaire which will determine whether you can use norethisterone safely. Who should not use norethisterone? Norethisterone may be suitable after having had a check up with your doctor. We are unable to prescribe period delay tablets if you fall into any of the above categories, as it requires specialist monitoring. Can I take norethisterone with other medication? You should speak to your doctor if you are taking any medication that falls into the above categories. You may still be able to take norethisterone under your doctors’ supervision. You should see your doctor if you wish to take period delay tablets, but have a condition or are taking any medication that cannot be used with norethisterone. You are experiencing shortness of breath, rapid heart beat, chest pain or you cough up blood. These are symptoms of a blood clot in the lungs, which is extremely rare. What is the difference between norethisterone and Utovlan or Primolut N? Utovlan and Primolut N are the branded versions of norethisterone. They all contain the same active ingredient (norethisterone) and the only difference may be in the inactive ingredients (such as excipients that bind the tablet together). They all work in the same way and are equally as effective. Some women may have tried a particular brand and may want to stick with that, but no particular brand is better than the other. If you would prefer a particular brand, please get in touch and we will try our best to accommodate. Am I allowed to take norethisterone on the plane? You will be allowed to take your medication onto the plane as part of your hand luggage. Always ensure that your tablets are in the box provided, with the pharmacy label which states your name and instructions. To be extra sure, we advise checking with the airline before travelling. Am I allowed to take norethisterone to another country? It is important that you check the rules for the country that you are travelling to. Most countries will not have an issue and you can safely bring medication for personal use into their country. Some countries such as Dubai, will require you to bring a copy of the prescription. We suggest that you check with the embassy of the country that you’re travelling to for the correct procedures in regards to bringing prescription medication into other countries. If you require a copy of your prescription, please do let us know. How can I buy norethisterone online?